Have you ever found a trail of ants on your kitchen floor or a cobweb in your storeroom? You must have thought of ways to get rid of the pests that are causing distress to you and damaging your house. If you are neglecting pests in your house, you are inviting serious threats to your house and health. Experts say that it is necessary to engage pest control professionals at regular intervals of time even if you do not find any signs of pest infestation. According to them, most of the pests are nocturnal and it is likely that you will not see them in and around your house. Moreover, pests do not take long to infest your house and they reproduce at a rapid rate. You should always keep in mind that all the houses, new or old, are vulnerable if any pest treatment is not conducted. A lot of the house owners are unaware of the necessities of hiring a pest control service for the protection of their houses. This is potentially harmful as if any house is left untreated at regular intervals, pests can infest at any time and disturb the healthy habitat. There are a few reasons for which you need to get a professional pest control service in Las Vegas. Let us go through those reasons. Better health – Pests are not only creepy and disturbing but also potentially harmful to human health. Pests infestations damage property and on top of that pose potential health risks for children and adults. The most affected part of the house is likely to be the pantry and pests carry disease-causing bacteria and viruses. The most effective way to eliminate pests is by hiring pest control professionals. Trying out home remedies is not okay as you will only worsen the problems. Successful elimination of pests – Professional pest control service in Las Vegas is needed for successful elimination of pests. As already said, home remedies do not work as in most of the cases the problems get worse with unprofessional treatment. You absolutely need professionals to eliminate pests from your household and the surrounding areas. Professionals are not only adept at eliminating different types of pests but they also maintain quality control and use products that are environmentally friendly. When you are hiring a reputed professional, you can be sure that your house is in safe hands. Future proofing – Professionals are required in order to future proof your house from pest infestations. Professionals are trained in this field and they know exactly why and from where the pests are coming. After a thorough investigation, the trained personnel can take the necessary steps to protect your house from future infestations. Low expense – Expense is what you should consider when dealing with pest infestations. You might initially think that home remedies are cheap and there is no need to invest in a pest control service from Las Vegas but there you go wrong. Home remedies are useless expenses and you can try several ways in vain. Considering all the expenses, you will surely find that hiring professionals are a convenient option. Conclusion – There are a lot of benefits of finding a pest control professional at your disposal. 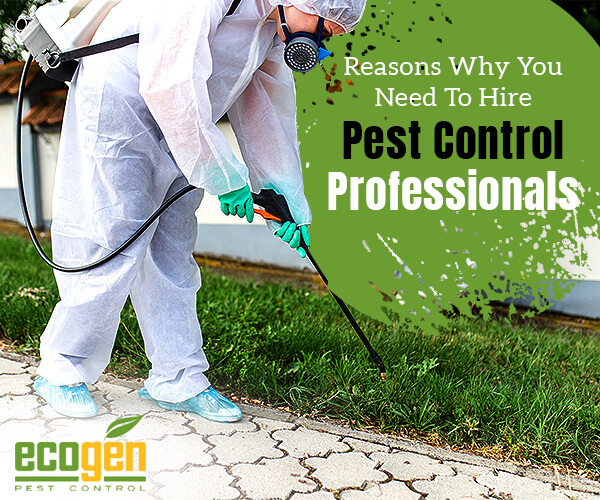 You should consider the above-mentioned reasons for hiring a pest control professional. A house is a place where you seek peace. Take constructive steps to make it safe and hygienic.